However, Black Friday changed that. Engineer chauffeured my friend and I to all the shops, expertly navigating all the way. One of the stops we made was Ellis Pottery (which had and awesome sale going f.y.i.) 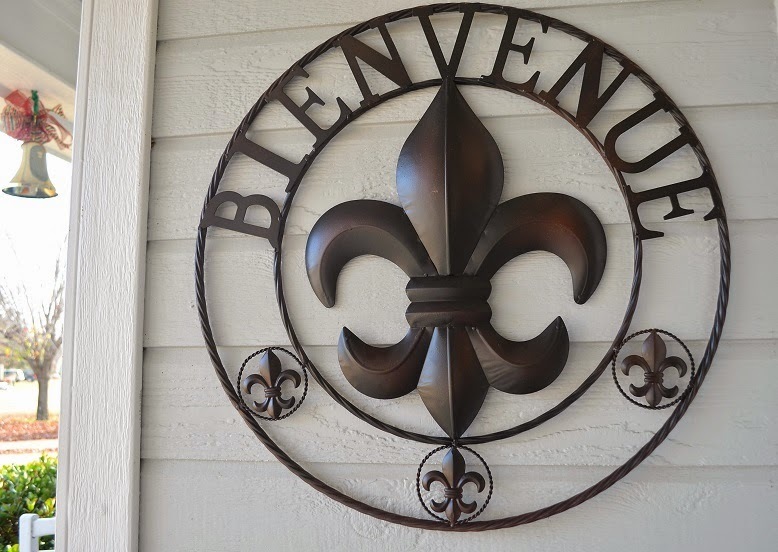 and while we were there, we picked up an ornament for the porch - a sign which reads "Bienvenue" with a fleur de lis or four on it. It is there now welcoming all who visit whether of Cajun/Creole heritage or otherwise. It is my Christmas gift to Engineer. Tangible evidence of acceptance of the move and the state. Acceptance of our lives here and now. I'm telling you why...because my daughter is watching my actions and I want to set a better example for her. Nothing to do with a fat man in a red suit at all. 1-4-3 EM and I will laissez les bons temps rouler with you always. So true about setting a great example!! I need to be ever vigilant about what kind of example I am setting for Diva. Your shop is always full of cute delights so the fleur de lis will fit right in.